In the Carnation pattern H5084. 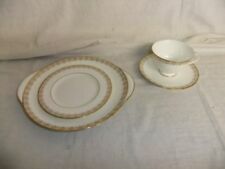 Royal Doulton Teacup and Tea Saucer. with pink flowers, blue foliage and platinum gilded rims and cup handles. 'CARNATION' H.5084. ROYAL DOULTON. MARKED FACTORY 2ND QUALITY. BACKSTAMP: PER PHOTO. May show signs of light wear/usage. 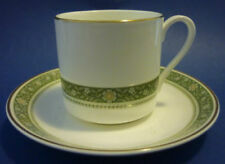 ROYAL DOULTON ‘CARNATION’ PATTERN H5084 BONE CHINA. Status: Discontinued. Actual: 1983 – 1998. 'CARNATION' H.5084. ROYAL DOULTON. SET OF 6 X DINNER PLATES. 1ST QUALITY. BACKSTAMP: PER PHOTO. 'CARNATION' - PATTERN H.5084. ROYAL DOULTON. 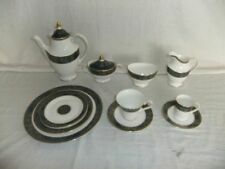 15 PIECE PART COFFEE SET. 2ND QUALITY. BACKSTAMP: PER PHOTO. 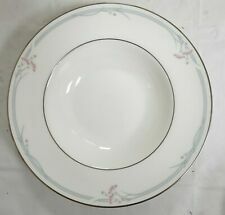 ROYAL DOULTON ‘CARNATION’ PATTERN H5084 BONE CHINA ROUND EARED CAKE PLATE 10.75" (27.3CM). May show signs of light wear/usage. 34.3cm width (13.5in) x 26cm depth (10.25in). Royal Doulton Carnation Cake Plate. ROYAL DOULTON. Cake or Sandwich Plate. Bone China & Made in UK! 2nd Quality. Can: 2 3/4" x 2 5/8" (7cm x 6.7cm). 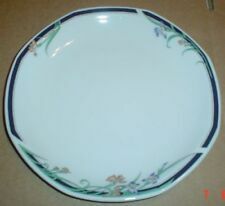 Royal Doulton dinner plate in the popular Carnation pattern. Fully backstamped with the Doulton logo. 10 1/2" across. 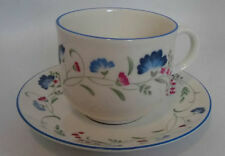 ROYAL DOULTON ‘CARNATION’ PATTERN H5084 BONE CHINA. GRAVY / SAUCE BOAT & UNDERPLATE. Gravy boat stands 3.75" (9.5cm) high. 41.3cm width (16.25in) x 31.1cm depth (12.25in). SET OF 8 ROYAL DOULTON ‘CARNATION’ PATTERN H5084 TEA / SIDE / BREAD & BUTTER PLATES 6.5" (16.5CM). May show signs of light wear/usage. ROYAL DOULTON. Cup & Saucer. Location: glass. Mint Condition. SET OF 12 ROYAL DOULTON ‘CARNATION’ PATTERN H5084 SALAD / STARTER / DESSERT PLATES 8" (20CM). May show signs of light wear/usage.